– Child from 0 to 05.99 Years sharing parents’ cabin free of charge. – 2 Children in a separate cabin will be charge as a one Single Cabin. – 1 Adult + 1 Child will be considered as a Double Cabin. P.S: all Meals Excluded Drinks even water except (Tea or Coffee or Juice with breakfast only) on the Dahabiya Boat. On Average there are about 15 to 18 persons working in the Dahabiya boat. The Guest sees only 5 or 7 persons of the crew. So it is unfair to give tips to people that you see and forget other people. 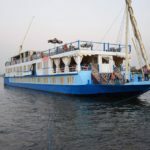 That’s why there is a rule in all Nile Cruise boats that Guest should not pay any tips for anyone during the Nile Cruise Trip. All Tips must be given at the end of your trip. You put your tips in an envelope and write the amount on the back then leave it at the Reception of your Nile Cruise. 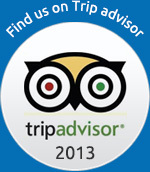 All Tips will be collected from clients and divided to the whole Cruise Staff. This is a Fair solution for everyone. 8 US$ x 3 Nights x 2 Person = 48 US$. So you Leave 48 US$ in an Envelope at the Reception on the End of your Nile Cruise Trip.